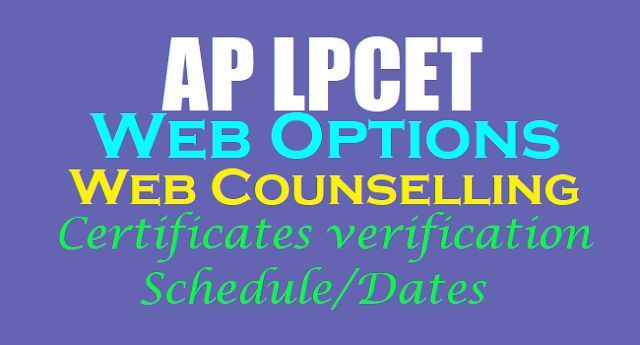 AP LPCET 2019 Web Options Start Date - End Date, AP LPCET 2019 Web counselling Schedule, Web Options Exercise Schedule for AP LPCET 2019, Payment service for AP LPCET 2019 Web Options - Web counselling. AP LPCET 2019 Web Options, Web counselling, Certificates verification Schedule/Dates: AP LPCET 2019 Certificates Verification Schedule: LPCET means Language Pandit Common Entrance Test and it will be conducted every year. AP Govt. and Department of School Education Officials given the Language Pandit Common Entrance Test(AP LPCET-2019) Notification in July 2019 for admission into one year Language Pandit Training Course(LPT) in Govt. IASEs /CTEs and Private LPT Colleges in Andhra Pradesh State. DSE AP invited the online applications from the eligible candidates through its official website from .......-03-2019 to ......-04-2019 as per schedule for admission into Language Pandit Training Courses in state for the academic year 2019-2019. Eligible candidate were applied for this stream, they were appeared in the month of May 2019 in all Districts of the AP State and they were checked their results at its official website. Appeared candidates are waiting for admission into LPT Courses. AP LPCET 2019 Web Counselling Schedule/Admission Schedule has been announced by School Education Department, AP. In this process, procedure for submission of preferences through web based selection form will be available at https://aplpcet.apcfss.in for admission into language pandit training courses . The admissions will be made as per the rank obtained in entrance test through web based selection of colleges. A. Online submission of preference of colleges through web based selection. B. Allotment of seat and download of Provisional Admission Letter. C. Issue of Final Admission Letter after verification of certificates and payment of course fee at DIET of the district concerned on dates given on the Provisional Admission Letter. *Allotment of seats to candidates by the CGG: .....-05-2019.
we will provide AP LPCET 2015 News ..
IS THE L.P HINDI COURSE EQUIVALENT TO B.ED ?